In 1898 the British government commissioned a railway bridge to be built across Kenya’s Tsavo River. A large crew of African and Indian workers were supervised by the Irish engineer Lt. Col. John Henry Patterson. Over the course of the year, however, one worker after another were taken in the night. Before long the source of the disappearances was determined to be a pair of male lions, nicknamed “the Ghost” and “the Darkness” by the assembled labourers. By the time Patterson successfully shot the two lions dead dozens of men had been slaughtered by the lions. Patterson’s own account (in a book titled The Man-Eaters of Tsavo) put the total deaths at 135. More recent analysis suggests the actual number of deaths to be something like 35; less than Patterson’s exaggerated account but still a horrifying total for one pair of animals. To this day no one has a definitive answer as to why the Ghost and the Darkness killed so many people, although there are a few theories. The inexplicable nature of the lions has made them rich fodder for the imagination, no longer just wild animals but terrifying, inexplicable monsters – more supernatural than natural. With this is mind, it’s hardly a surprise that the lions of Tsavo have received a motion picture adaptation not once but on at least three separate occasions. The first was Arch Oboler’s 1952 film Bwana Devil, starring Robert Stack and Barbara Britton. This cheaply made action-thriller was the first 3D feature film ever produced in colour and sound, and sparked a temporary craze for similar 3D features in the USA. The third was Darrell Roodt’s 2007 thriller Prey, which swapped the genders of both protagonists and lions in a contemporary retelling of the Tsavo incident. Between them is The Ghost and the Darkness, a 1996 film written by William Goldman (The Princess Bride) and directed by Stephen Hopkins. The Ghost and the Darkness sort of came and went in 1996, released on 11 October to middling box office and fairly weak reviews. I was taken with the film the first time I saw it, and it’s remaining in the back of my head ever since. It is a highly effective, slickly presented horror movie: a Jaws for the Serengeti. Gibson turned the project down, but Costner seemed relatively keen – until he learned that his offer was forming part of some gambit by Paramount to convince Cruise to take the role. Costner pulled out and Cruise wasn’t interested. While actor negotiations were ongoing Paramount executives started discussing the project with director Brian De Palma, whose period thriller The Untouchables had been a major hit for the studio. When De Palma’s highly anticipated film The Bonfire of the Vanities flopped in cinemas, those discussions were suddenly closed. For a brief period Kenneth Branagh was considered as a replacement – by early 1990 the British actor/director was in growing demand thanks to his successful film adaptation of Shakespeare’s Henry V. Without Cruise, Gibson or Costner, however, Paramount wasn’t prepared to move forward. Without a nominated director or star, Goldman’s screenplay was quietly shelved. 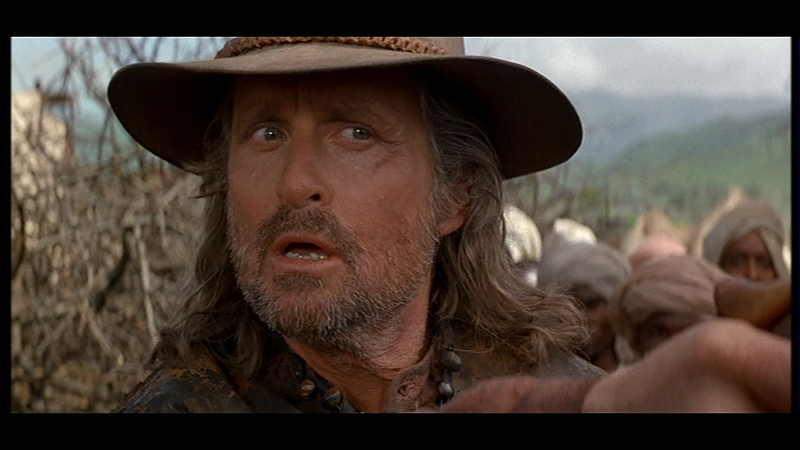 It was actor Michael Douglas who picked up The Ghost and the Darkness and brought it back to Paramount Pictures. Throughout his career he had divided time between acting in films and producing them, and had won an Academy Award in 1976 for producing One Flew Over the Cuckoo’s Nest. In 1995 he partnered with fellow producer Steven Reuther to establish Constellation Films, and together they assembled $500 million in funding to develop feature films. That year they announced a deal with Paramount to produce four major productions for the studio: Sydney Pollack’s remake of Sabrina, an adaptation of the John Grisham novel The Rainmaker, A Song for David – an ultimately unproduced film that would pair him opposite his own father Kirk Douglas, and The Ghost and the Darkness. To direct the film Douglas and Reuther approached Jamaican-born filmmaker Stephen Hopkins. Hopkins had already directed a string of studio-funded action movies including Predator 2 (1990), Judgment Night (1993) and Blown Away (1994), and boasted both a strong visual eye and an ability to stick to a budget and production schedule. 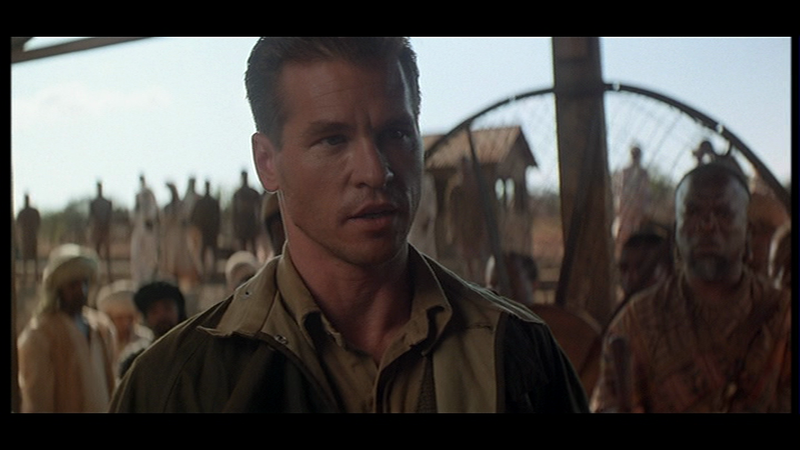 Paramount rapidly zeroed in on Val Kilmer to play the lead role of John Patterson. At the time he was being widely hyped as the star of Joel Schumacher’s Batman Forever, and was being showered with offers from all of the major studios. While squeezing the film into his schedule proved difficult – Kilmer starred or co-starred in six films in 1995 and 1996 alone, including The Ghost and the Darkness – a deal was made and the actor signed on. The studio commissioned the film on a budget of approximately $55 million. While there were initial hopes to shoot the film on location in Kenya, security concerns led the studio to relocate to the comparative safety of South Africa. The Songimvelo game reserve in Mpumalanga was chosen as a suitable stand-in for Tsavo. Goldman was rehired to make adjustments and rewrites to his original screenplay. The supporting character of Redbeard – a big game hunter who assists Patterson – was expanded, changed from English to American, and renamed Remington. At least one Paramount executive suggesting change Patterson’s nationality to American as well; Kilmer threatened to quit the project if that change was made. 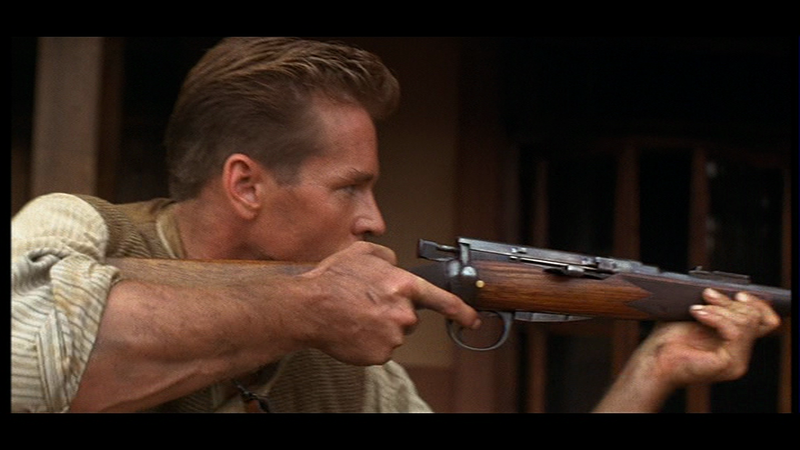 Once formally cast in the role, Douglas made numerous suggestions to William Goldman on how to further expand Remington – including elaborating on the hunter’s past. While unhappy with the changes, which he felt undermined the character, Goldman complied and the expanded and humanised Remington was the version portrayed in the final film. Ironically while the existing bridge across the river washed away, the mock-up half-bridge constructed for the film withstood the deluge. Samburu tribesmen from eastern Africa were cast as Remington’s warrior allies. None of the performers had seen a motion picture before, and special consideration was given to allow them their own diet and time and privacy to conduct ceremonies and rituals each day. To portray the titular Ghost and Darkness, the production team used a pair of trained male lions named Bongo and Caesar, who were flown to Africa from a zoo in Canada, as well as four additional lions from France and the USA. 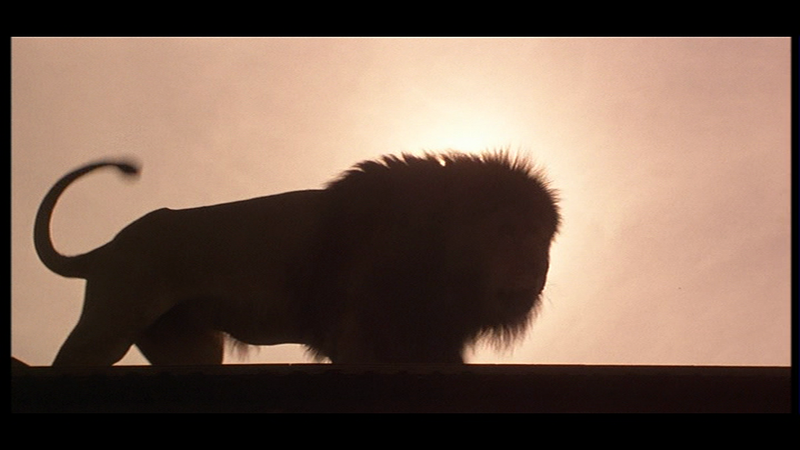 Ultimately only one shot in the entire film used an animatronic replica; the real lions performed the rest. 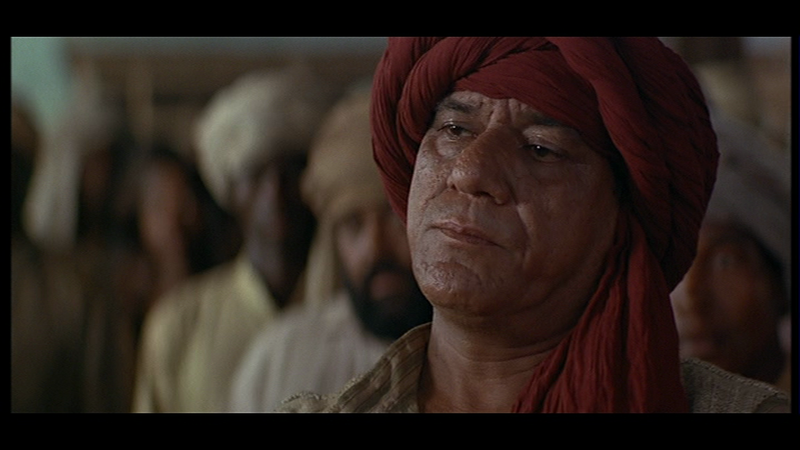 While genuine lions were used in all but one shots, they rarely shared a shot with a human actor. Motion-controlled cameras were used to shoot each scene twice – once with the lion, once with the human actor – and the two takes were digitally composed together during post-production. More than 120 digital effect shots were employed in the completed film. Early in the shoot one of the supporting lions broke from its cage and attacked a supporting performer. While the actor was not badly injured, the lion was retired from the shoot and sent home to Los Angeles. Ironically, and despite the sole lion attack, it was other local wildlife that caused problems for the shoot. Spotters were employed to keep an eye out for notoriously ill-tempered rhinoceroses on the plain and potentially territorial hippopotamuses in the swollen river below. The Ghost and the Darkness opened in American cinemas on 11 October 1996. It faced stiff opposition, with Universal’s John Grisham adaptation The Chamber and New Line’s action vehicle The Long Kiss Goodnight opening on the same day. In the end it went neck-and-neck for which film topped the box office that weekend, with The Ghost and the Darkness’ $9.2 million ultimately beating The Long Kiss Goodnight by about $150,000. By the end of its first week The Ghost and the Darkness had grossed $12.7 million in American cinemas. It only fell by 26% in its second weekend, pushed down to second place by Barry Levinson’s Sleepers. Its third week saw it slip down 41% to fifth place. Box office dropped by another 17% in its fourth week, and another 52% in its fifth. By the time it left American cinemas it had grossed only $36.5 million dollars from an estimated $55 million dollar budget. International sales grossed an additional $40 million or so, but with distribution fees, promotion and advertising costs and the cut for the cinemas, the film did not enter into profit. Home video sales and television licensing would ultimately bring it over the line. While The Ghost and the Darkness was not a commercial success, Paramount was simply pleased to cement their working relationship with Douglas and Reuther. Their next production for Paramount, the John Woo action film Face/Off, was a much more successful film. Douglas, however, had tired of the pressures of co-running a production company; Face/Off would be his final film as an executive producer. He returned to focus on his acting instead, delivering a string of acclaimed performances in The Game (1997), A Perfect Murder (1998), Wonder Boys (2000) and Traffic (2000). Sometimes mainstream film critics make the wrong call. Perhaps they were too jaded from seeing that month’s endless stream of recycled Hollywood offal. Maybe they simply weren’t fans of action-thrillers. It’s possible each critic simply had an off-day, freakishly timed for the same week. Whatever the reason it’s important to stress that Ebert, Travers and all of the other frowning, dismissive critics got their reviews wrong: The Ghost and the Darkness is a slick, well-crafted thriller that still sticks in the mind almost 20 years after the fact. A key part of the film’s appeal is that it’s essentially true. Historians and veterinarians quibble with Patterson’s estimate of the lions’ body count, but the fact remains that in 1898 two male lions did maul and kill a disturbing number of people. Patterson really did head out to shoot and kill the lions. That knowledge that the film is based on extraordinary real-life events gives the entire piece an edge that other thrillers often lack. On top of that sits William Goldman’s excellent screenplay. I think he is too hard on Michael Douglas’ re-envisaged Remington, but even putting that character aside he has told the story with remarkable efficiency and with rich, well-developed characters. A lesser film would render the various labourers and supporting cast as cyphers, or meat for the lions. Instead Goldman actually gives each one of them a distinct back story, personality and depth. Each gets his own moment to shine (I use ‘his’ deliberately – small cameos by Emily Mortimer aside, this is an entirely male film). Whether it’s John Kani’s impressive Samuel, or Om Puri’s frowning, recalcitrant Abdullah, or even Bernard Hill’s disgraced, cantankerous Dr Hawthorne, they all get their moments. They feel real; and because they’re real the threat of the lions feels even more severe. It’s easy for a film to kill a character – decades of cheap slasher flicks do it all time. It’s much, much more difficult for a film to kill a character we understand and like. It is a very classical screenplay. This could easily have been written in any decade from the 1940s to the 1990s and not too much would have changed. William Goldman is like that: he knows intimately what works in a narrative screenplay and what doesn’t, and in most cases his name on the credits is a guarantee of an efficiently told and entertaining story. At the film’s centre is Val Kilmer as Patterson, thankfully still Irish, and performed remarkably well by a notoriously unpredictable actor. 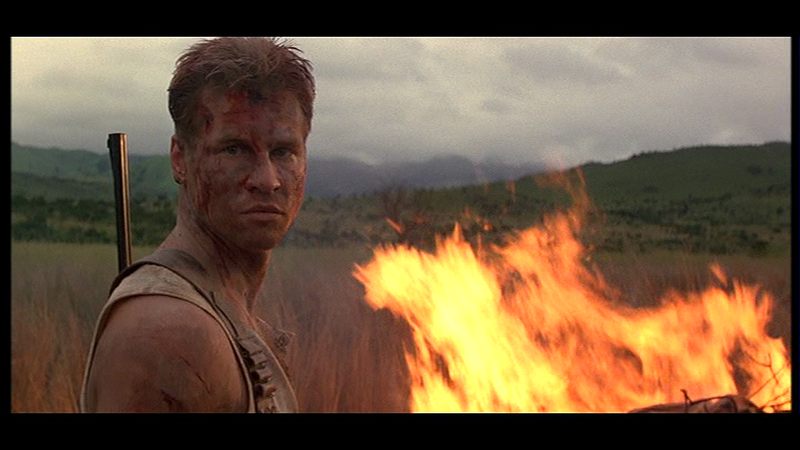 You never can tell what you are going to get from Kilmer from one film to the next. His Doc Holliday in Tombstone was exceptional, as was his Jim Morrison in The Doors. Given a broader, more loosely outlined character like Bruce Wayne in Batman Forever or Madmartigan in Willow and the performance quality seems to evaporate. 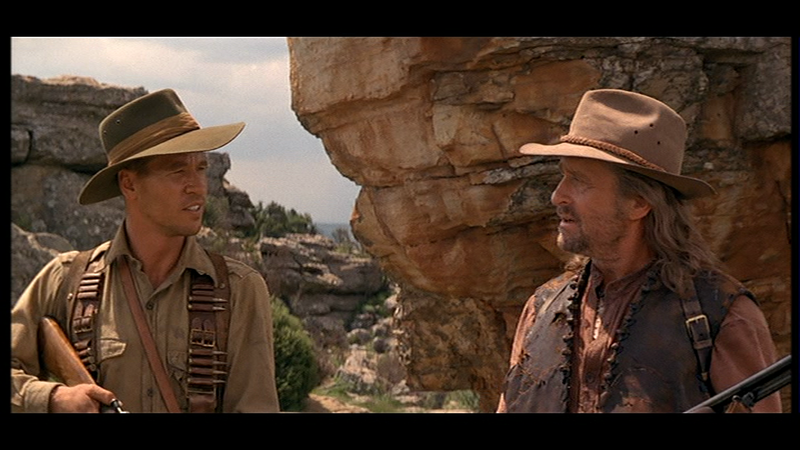 Patterson seems to have enough distinctive qualities to keep Kilmer focused and engaging throughout the film. When Michael Douglas turns up halfway through it is either a welcome shot of adrenalin or a film-breaking nightmare, depending on how you respond to his broad, enthused performance. This is easily the most exaggerated and over-the-top Douglas has ever been on screen, and he comes in at precisely the moment where the film would otherwise begin to falter and lose momentum. We will never know what Goldman’s original vision for the character would have been like, but it would have to be pretty entertaining to top Douglas’ energetic presence. 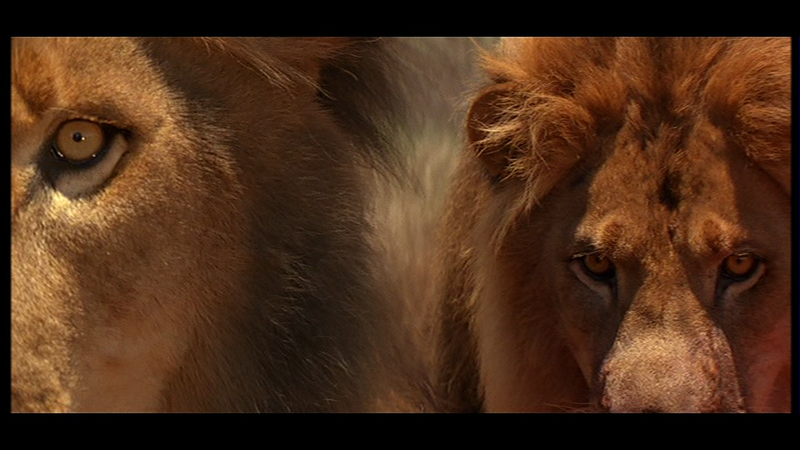 To be honest, the film’s real stars are the lions. Test screening audiences worked this out very early in the day, and the mistake on behalf of the production team was not in failing to make Patterson or Remington more likeable but rather in failing to acknowledge that this was the point. It’s a film whose title refers to its villains, and like all good action-thrillers it is able to succeed predominantly on their backs. Stephen Hopkins does a masterful job directing the Ghost and the Darkness. It’s easy to direct a frightening scene set in the middle of the night, when shadows lie everywhere and monsters could be hiding behind you at any time. Conversely it is extremely difficult to achieve a similar degree of tension in broad daylight. In fact only two films come to mind that really draw a lot of tension from a daytime sequence, and those films are Jaws and The Ghost and the Darkness. Marc Eliot, Michael Douglas: A Biography. Crown Archetype, New York, 2012. Bonnie Churchill, “The unstoppable Michael Douglas”, Christian Science Monitor, 15 October 1996. Quoted in The Ghost and the Darkness production notes, Constellation Films, 1996. Rebecca Ascher-Walsh, “Psycho Kilmer”, Entertainment Weekly, 31 May 1996. William Leith, “A solitary man”, The Telegraph, 26 March 2004. Robert W. Welkos, “He knows they don’t know”, Los Angeles Times, 2 April 2000. Roger Ebert, “The Ghost and the Darkness”, Chicago Sun-Times, 11 October 1996. Peter Travers, “The Ghost and the Darkness”, Rolling Stone, 11 October 1996. Joe Queenan, “Newman, Hoffman, Redford and me”, The Guardian, 25 April 2009.